greenjersey didn’t ride as all his bikes have quick-release wheels. Only kiddin wack. 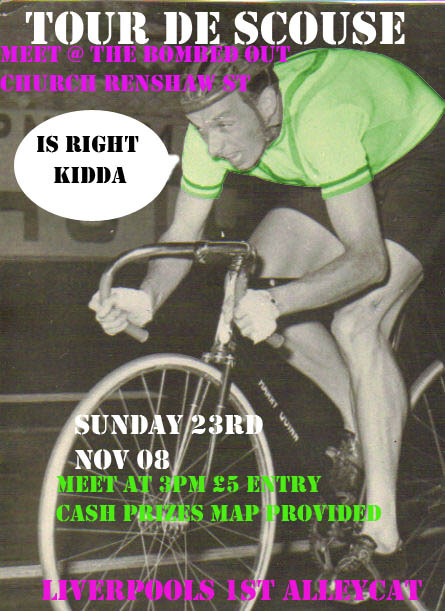 The rider is Liverpudlian Norman Sheil twice world amateur pursuit champion in the fifties. 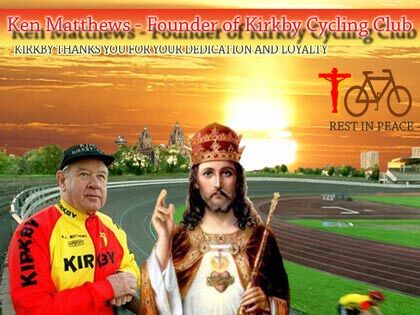 I have just found on a Scouse website this rather unusual tribute to the late Kirkby CC stalwart. Is that Doug Dailey next to Ken? Boogerd sells house, maybe to pay for more teeth whitening? Former dutch pro Michael Boogerd has put his house in the Antwerp area up for sale. The asking price for the property, which was built in 2000, is 1,450,000 euros. It seems that Boogerd has separated from his wife Nerena, a former Miss Holland, whom he married in 2002. If the smiling Dutchman is in urgent need of the money greenjersey hopes that the property market in the Low Countries is in better health than here in the UK. Not surprisingly Fillipo Simeoni is pissed off that as Italian champion he is unable to find a berth with a decent team. Equally unsurprisingly he blames most, if not all, his troubles on Lance Armstrong. In seeking to defend the indefensible the Texan has come up with quite a story. As reported on Velonews Armstrong says:- “First off, I did not chase Simeoni down, I was simply following his wheel. That is the truth of the matter. I never bridged across to Simeoni. He was in front of me, people were attacking, he accelerated, and I stayed on the wheel. We have footage of the race that will back that up. There was never more than bike length between us. There was no gap closed. There’s a big difference between following wheels and closing a gap.” Armstrong said he’d naturally expected the peloton to follow, and was surprised to see that the pair had opened a gap when they reached the day’s breakaway a few kilometers later. I don’t know how much coverage I have watched of Armstrong at the Tour but it must be hundreds of hours. Not once have I seen him cover a move by a “nobody”. After all that is what Hincapie and the rest were on the team for. The Twisted Texan says he has the film of Simeoni’s move to join the break showing that he let Simeoni just pull him out of the bunch, not that he thought that was what happened, he was just practicing for the day when he came back as a super-domestique.! Good news for Contador that Armstrong was thinking ahead to 2009! OK Lance, you say you have the film so let’s see it. Put it on YouTube for the world to see. If Lance is too busy I am sure that there are plenty of LA fans out there who have a complete library of the life and times of Lance Armstrong who will be happy to turn up the 2004 Tour. I can’t wait.